How to update AT&T Galaxy S5 & S5 Active to Android 6.0.1 Marshmallow? 11 Comments on How to update AT&T Galaxy S5 & S5 Active to Android 6.0.1 Marshmallow? We have seen several AT&T supported devices being updated to the latest Android 6.0.1 Marshmallow OS including the AT&T Galaxy S6 (Edge), Galaxy S7 (Edge), AT&T Note 5, and much more. 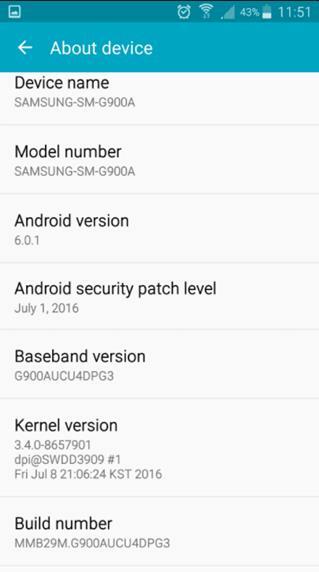 Today, Samsung along with ATT carrier have released Android 6.0.1 Marshmallow for the beloved Galaxy S5 SM-G900A. It comes with the firmware build number G900AUCU4DPG3 which is the latest Marshmallow build. Prior to this, the carrier released G900AUCU4DPE3 with May security patch level & G900AUCU4DPF3 with June security patch level. However, with PG3, you get latest AOSP build MMB29M with July security patch level. UPDATE: Download and install AT&T Samsung Galaxy S5 G900A latest firmware G900AUCU4DPH2 and AT&T S5 Active G870A firmware build G870AUCU2DPH2 based on Android 6.0.1 Marshmallow and AOSP build MMB29M. The AT&T support page has not yet updated us with the new features, fixes that come with this PG3. Users have reported this firmware to be rolling out across the United States. However, S5 users who have unlocked their phones or users outside the US may not receive this update over the air. For that, you will need to flash the update manually. Fortunately, we have listed the latest firmware for the same in order to update in no time. Here we have listed a full firmware file of flashable through Odin s/w as well as OTA update package flashable via stock recovery. So no matter which firmware you run, be it Android 5.1 Lollipop or otherwise, you can still take your precious S5 to the latest on. If you get a 404 error while downloading then take a look at this post. It may help downloading the official ATT update. the files are not yet available. We will be updateing it here soon. How to Install AT&T Galaxy S5 (Active) G900A/G870A Android 6.0.1 Marshmallow Update? The files listed above are OTA updates. Hence, you need to flash them either via stock recovery by choosing apply updates from SD Card or via ADB sideload method. You will need to update your firmware gradually. Meaning, first check the firmware build number of your device and then flash the proper OTA file. Go from v1>v2>v3>v4. Note: This is a manual update method. Hence, you should be cautious about it. This procedure may wipe your data and apps. So make sure you backup everything on your PC like Contacts, Messages, Applications, pictures, and videos. Go through the prerequisites and then proceed with the instructions from below. Reader’s discretion is advised. 1. Verify your device for compatibility. The Marshmallow ROM is compatible with the listed AT&T S5 only. 2. Make sure you have latest device drivers setup on your PC for a better connection. Get it from the official page of your device manufacturer. 3. Make sure your device is on at least PA2 official Android 5.1.1 Lollipop firmware. Otherwise, download the PA2 Odin firmware and flash via this tutorial. Step 1: Download the firmware or OTA file for your Android device. You don’t need to extract the file, just place the file in the phone storage like SD Card where you can easily locate it. Step 2: Add or replace .zip extension to the file you downloaded on your phone. For instance, if PF3 to PF8 is .bin then change it to .zip). You may need a separate application to do so on your Samsung device. Better rename it on your PC and then transfer the file. Step 3: Move it to an SD card with at least 2GB free space. Step 4: Reboot into recovery. Turn off the phone and wait a minute for it to completely turn off. Hold Volume Up + Home + Power until you see a little Android guy. Step 5: Once into recovery, Select Apply Update from External Storage. That’s it wait for the operation to complete. Alternatively, if the above procedure fails, you can also manually flash it via ADB sideload. Check out the full tutorial from here. I have the AT&T S5 Model SAMSUNG-SM-G900A, running Build # LRX21T.G900AUCU4BOF3 My build isn’t listed above. Is there a further set of updates I should run tp bring my device up to PA2? My phone is unlocked, so I suspect that putting my AT&T SIM from my current phone would not help. One thing you can do is. Flash the PA2 full firmware file using Odin (file listed above). Then once you get the PA2, use the OTA updates like PA2 – PA3 & PA3 – PH2 and flash using one of the 2 methods listed below. You can use stock recovery and ADB sideload as well. I installed G900AUCS4CPA2_User_Binary.zip on my S5 using Odin and it worked perfectly. However, when I tried the update PA2 – PA3 (using the update from external storage option) I got an error and my S5 went back to PA2. How can I make it work? I apologize for the basic question, but v1, v2, v3, v4 – should I get the latest? Or do I need to do them all one by one? Does the Android V6 update on the S5 Active allow reception of the Chinese Big Dipper (BieDou) GPS satellites. ? I’ve an AT&T unlocked galasy s5 with android 5.1.1 with level patch 2016/08/01. I want to update my device to Android 6.1 with latest security patch. But, I’m living in Italy. So I cannot to update my device 900A! I’ve downloaded 2 version of firmware flashable with Odin. Is this correct versions to update to android 5.1.1 to 6? If affirmative, what is the rigth sequence to flash latter firmware?